The software RP Fiber Power can solve rate equations not only for simple gain systems with a single metastable level, but even for user-defined energy level schemes involving arbitrary optical and non-radiative transitions and energy transfers, where the rate equations become nonlinear. It can simulate the temporal evolution and calculate the steady state. Rate equation models can be part of more comprehensive numerical models, which describe e.g. 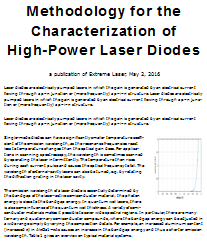 the spatial distribution of optical powers in fiber amplifiers or bulk lasers, or the dynamic behavior of Q-switched lasers. They can thus help in understanding quantitatively the operation of laser and amplifier devices, and allow one, e.g., to evaluate whether the performance of a device is close to the limitations set by the fundamental principle of operation. Figure 1: Energy levels and transitions in an erbium-doped gain medium. As an example, consider the dynamics of an erbium-doped gain medium, such as used in, e.g., erbium-doped fiber amplifiers. Figure 1 shows the energy level diagram and the most important radiative and non-radiative transitions. Erbium amplifiers and lasers operating in the 1.5-μm spectral region exhibit a quasi-three-level scheme. For simplicity, the energy levels (actually Stark level manifolds) of the erbium (Er3+) ions are labeled on the left-hand side with an index which is e.g. 1 for the ground-state manifold 4I15/2 and 2 for the upper-state manifold 4I13/2. Optical absorption and stimulated emission transitions, as caused by a pump beam at 980 nm and a signal beam at 1550 nm, are indicated with blue arrows, and the gray arrows indicate spontaneous and non-radiative transitions. The lower transition (level 2 → 1) is mostly caused by spontaneous emission, whereas the upper transition (3 → 2) is dominated by multi-phonon transitions. Only transitions between the lowest three levels are considered, assuming that excited-state absorption to higher levels and upconversion processes are weak. where nj indicates the fractional level population of level j. This variable is e.g. 1 if all ions are in the corresponding level manifold. As only the mentioned three levels are involved, we have n1 + n2 + n3 = 1. (The parameters nj can also be interpreted as excitation densities with units of m−3; only in rate equation systems containing nonlinear terms, e.g. for energy transfers, the form of the equations depends on that interpretation.) The parameters Ajk indicate spontaneous transition rates from level j to k, with units of s−1. For example, A21 is the inverse upper-state lifetime. Furthermore, the equations contain absorption and stimulated emission rates, which are determined by transition cross sections σjk (the values of which are dependent on the wavelengths involved), optical intensities Ip and Is at the pump and signal wavelength, and photon energies hν. where of course one of the equations is redundant, as the sum of the two level populations must stay unity in any case. It is common to insert additional terms, e.g. for energy transfer processes. There may be, e.g., terms proportional to n22 for cooperative upconversion processes, where one ion in level 2 transfers energy to another ion in the same level, resulting in one more ion in the ground-state manifold and the other one in a higher level. Assuming that the higher levels quickly decay to level 2, the additions to the equation system are relatively simple. As another example, Ref. discusses rate equations for the more complicated level scheme of thulium (Tm3+) ions in fluoride fibers, including several excited-state absorption processes. It is also possible to include energy transfers between different species of ions. A common case is that of erbium–ytterbium-doped fibers, where primarily ytterbium ions absorb pump radiation, and transfer energy to erbium ions. The model then includes level populations for all involved types of ions, and the corresponding coupling terms. Additional optical wavelengths can be involved e.g. if amplified spontaneous emission (ASE) occurs in a fiber amplifier. In numerical models, the ASE spectrum is divided into discrete wavelength slots, each one being associated with different values of the absorption and emission cross sections. Generally, the rate equations have to be solved for different positions within the gain medium, as the optical intensities depend on both the longitudinal and transverse coordinates. It is also possible to calculate the evolution of both the population densities and the optical powers, e.g., in order to model the laser dynamics of a Q-switched laser. The set of differential equations then includes the rate equations for the populations as well as dynamical equations for the optical powers. In many situations, it is possible and convenient to derive equations for spatially averaged population densities. In the case of a simple level scheme, the population of the gain medium is then described with a single variable, which is directly related to the laser gain. This variable can then be used e.g. as a dynamic variable in the dynamic equations for population (or gain) and laser intensity, as discussed in the article on laser dynamics. Rate equations describe the statistical evolution of level populations, and are based on a number of assumptions. They do not describe coherent phenomena such as Rabi oscillations, as they average over many ions, which experience slightly different microscopic environments and different optical intensities. It is further assumed that all ions essentially function in the same way. The latter assumption can be violated e.g. if clustering occurs in the gain medium. In such a case, ions within clusters may exhibit, e.g., much stronger upconversion processes than other ions do, and should therefore be treated in the model as a separate species. Such extended models have been developed , but they are more complicated, and often involve a number of parameters which are hard to access experimentally.